Pope Francis has apologised for remarks he made last week in Chile defending a bishop accused of covering up sexual abuse. He said he realised his words hurt many, but repeated his belief that Chilean Bishop Juan Barros was innocent. The pontiff was speaking to journalists on board a plane flying back to Rome. Last week, he had said that victims who had accused Bishop Barros were committing slander. The Pope was openly criticised by Cardinal Sean O'Malley of Boston, who said he left victims of sexual abuse committed by priests feeling abandoned. "I apologise to them if I hurt them without realising it, but it was a wound that I inflicted without meaning to," said the Pope on Monday, as quoted by Reuters news agency. "It pains me very much." Bishop Barros has not been accused of abuse, but of being present when another priest, Fernando Karadima, molested young boys. When questioned by a Chilean journalist on Thursday, the Argentine pontiff had said: "The day they bring me proof against Bishop Barros, then I will speak. There is not a single piece of proof against him. Everything is slander. Is this clear?" This prompted some of Karadima's victims to hold a press conference where they said it was "offensive and unacceptable to say that we need to provide concrete evidence". 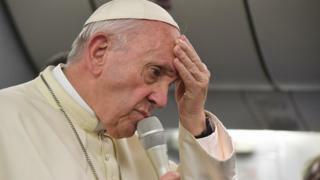 On Monday, the Pope said he regretted using the word "proof", saying he realised that it came off as a slap in the face. "There are lots of abused people who cannot show proof. They don't have it. Or they have it but they keep it to themselves, suffering in silence," he said. Protesters in Chile are not impressed with the Pope's apology. They say it is unfair that he is choosing to believe the bishop over victims. Juan Carlos Claret is the spokesperson for the parishioners of Osorno, who have repeatedly asked for the bishop's resignation. Reacting to the Pope's recent comments, he said: "The Pope is now saying that he refused the bishop's resignation twice because he thinks that [it] will show that he is guilty. That makes the Pope responsible for the misery that we are suffering." He added: "[The Pope] asks for evidence, but the victims have testified - isn't that enough for him? He apologises to us but now we need to see action. Sorry isn't good enough. Barros must resign." Across the country, a cartoon - by Chilean satirist Guillo - is now circulating through social media. It shows the Pope saying, "To believe in us you have to have faith. But if you want us to believe in you - you must bring me evidence". In 2010, Father Karadima was publicly accused of molesting several teenaged boys in the capital, Santiago, starting in the 1980s. After the Vatican found him guilty, he was sentenced to a lifetime of "penance and prayer". He never faced criminal prosecution in Chile as too much time had passed, but the judge who heard victims' testimony in a year-long investigation described them as "truthful and reliable". The Pope has been criticised for appointing Bishop Barros as bishop of Osorno, in south-central Chile, in 2015. The ceremony at which he was installed as bishop of Osorno had to be cut short over protests in the cathedral. How did this affect his latest trip? The Pope was greeted with protests in Santiago, with demonstrators insisting the bishop should not hold his role. Francis also met victims of sexual abuse by priests in the country. He cried with them and said he felt "pain and shame" over the scandal.